The images are haunting, evanescent. To average viewers they look like consequences of a war or a terrible natural disaster, but to Armenians they instantly evoke exactly what they are: Armenian children, most probably orphans, being herded onto ships leaving the Turkish port of Constantinople. The children jostle and fall backward as they are pushed up a steep boarding ramp. The wind sways them to and fro like paper dolls. 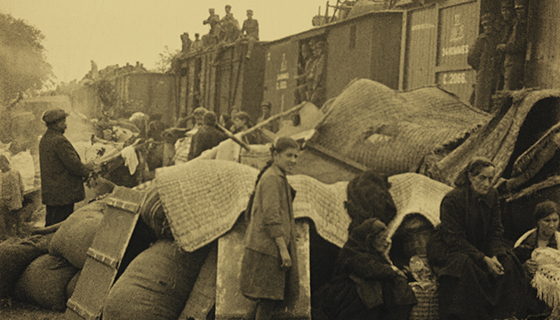 This scene is intercut by footage of emaciated Armenians being loaded onto train carts, taking them to their deaths. They are everywhere: on the car roofs, waiting by the train tracks, lighting small, pitiful fires to keep warm, all hope erased from their faces. 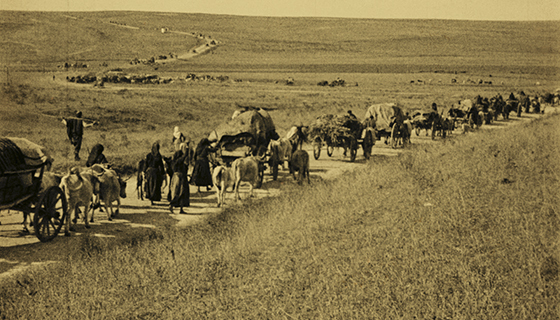 And then, finally, all-too-familiar images of Armenians marching along deportation routes. But amidst these tragic scenes there are also a few smiling faces: once the boats leave Turkey behind, youthful optimism takes over and some passengers appear to be relishing the adventure that awaits them, away from the brutality that they have just experienced. They are being led, one hopes, to freedom. These rare video images from the Armenian Genocide epoch were recently screened at the 29th Annual Bologna “Cinema Ritrovato” Festival. Swiss curator, archivist and filmmaker Mariann Lewinsky, who found the footage, has a history of making similar, remarkable discoveries. 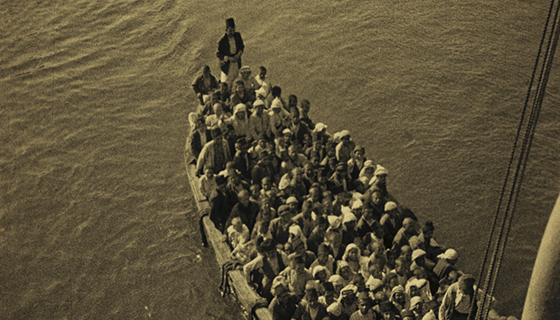 Using sleuth-like skills and instincts, this curator of the silent film sections at “Cinema Ritrovato” (“Rediscovered Cinema”) had a novel idea for the field of silent film curating to look back 100 years on the centennial of the Armenian Genocide: “For 1915 / 2015, I curated a special program with Armenian silent films, mostly from the Soviet period. But I was also researching the years before 1915 and, together with colleagues, put together a program that includes non-fiction material as well from 1911 to 1919,” says Mariann. Her most recent discovery, made in the U.S. Library of Congress, has landed in the global spotlight. “I found it under the title ‘Armenia: Cradle of Humanity’,” says Lewinsky. “Obviously this was not the title of the footage, but of some other film that was attached later on.” The Cineteca di Bologna restored the quality of the footage for the festival screening, 70 meters (or four minutes) long. “Some of them might be Armenian orphans taking a ship in Istanbul in 1918, others are probably Greeks during the so-called ‘population exchange’,” says Lewinsky. Experts who recognized an Istanbul palazzo in the background confirm that British forces used this building after the Armenian Genocide specifically in order to assemble Armenian orphans and evacuate them. Lewinsky continues: “It is an archetypical image of flight, refugees, of deportations—a result of war." Lewinsky’s other, related finds include “Heizer in Trabzond 1915,” which she discovered in the Gaumont Pathé Archive, and a 1918 film of refugee camp survivors from Musa Dagh in Port Said, Egypt, which she located in the French army archives. It was in Port Said that the AGBU financed a veritable tent city for survivors who were not only fed and clothed, but also trained in useful trades so that they might begin new lives in the Middle East, Europe and America. For the survivors’ descendants and Genocide scholars, these videos are a fantastic window on a terrible, lost world. Once Lewinsky obtained the “Cradle” reel, she was able to date it to 1923. 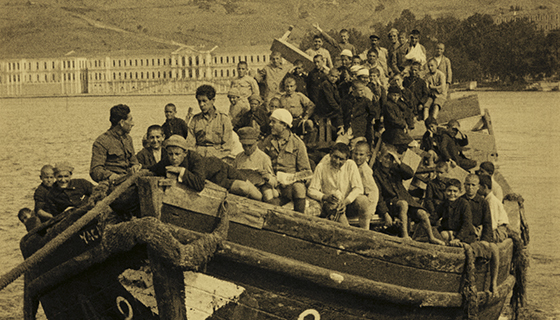 She says: “The images were extraordinary, boats full of children, trains.” But Peter Balakian, author of “Black Dog of Fate” and “The Burning Tigris,” questions the historical significance of the discovery. “What do survivor videos mean for the wider understanding of this history?” he asks. The Colgate University professor is concerned with what video per se adds to existing knowledge and interpretation of facts, and how it can deepen humanity’s understanding of what happened. Without a thorough analysis, a new video clip is yet another extra piece of anti-denialist evidence, and not much more. Yet there are also many positive aspects to the discovery at hand. 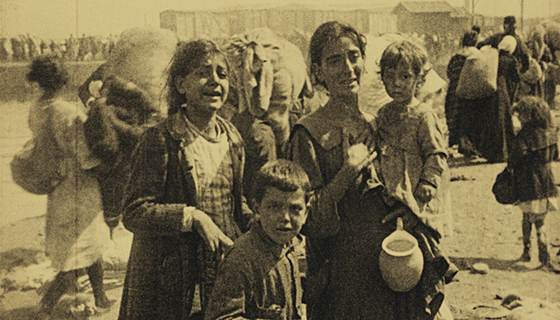 Wesleyan Professor Khachig Tololyan, the founder of Diaspora: A Journal of Transnational Studies, finds the discovery symbolic in and of itself: "The discovery of this silent film clip concerning the Armenian Genocide is eerily both metaphor and paradigm for nearly a century of neglect and denial. The film is silent, as so much testimony about the Genocide remained at first unspoken, and when finally spoken – unheard. The film was unknown, yet not actually hidden – merely neglected by researchers, visible in the U.S. archives, yet unseen." Tololyan is also curious as to who made the film and for what purpose: the conventions used to film the survivors as well as the framework of interpretation used to examine and analyze such finds are crucial for him. For writer and Armenian Genocide scholar Denis Donikian, who recently completed a monumental, 550-entry tome for the prestigious Le Monde blog titled “A Concise Encyclopedia of the Armenian Genocide,” Lewinsky’s discovery is important for its rarity: “Simply put, the Armenian Genocide happened in 1915, 30 years before the Jewish and Roma Holocaust. Video was so rare at the time that this find, even if it might otherwise be inconsequential, now becomes important.” But Donikian also warns against jumping for joy before the footage is properly authenticated: “You know that there exists a famous series of pictures of skeletal young Armenian children who are often labelled as ‘Genocide survivors,’ when in reality they are pictures of orphans taken in Yerevan during a terrible famine some years hence…I cannot judge adequately,” he says. But as Tololyan astutely notes, what these four minutes depict is perhaps nothing short of “the end of a community through Genocide, and yet also the beginning of a community of survivors who would engender the diaspora—a diaspora whose active agents, in cooperation with a revived post-Communist homeland, have created many great things." Images: stills from the “Armenia: Cradle of Civilization” video, courtesy of Fondazione Cineteca di Bologna.